A Journey of Awakening, from birth to rebirth. May we all awaken to our higher selves. Follow your heart to awaken your spirit. Reconnect with your inner-self and rediscover the natural power that we all have. It is within us, and it is all around us. Ascension = reaching for or rising to a higher state of consciousness. P - Stands for Inner Peace. Realization of inner peace helps lead to outward peace. H - Stands for Happiness. Happiness is a function of both the individual and a component of the whole. L - Stands for Love. Love is the universal constant. T - Stands for Truth. Truth is a component (and a result) of knowledge, awareness and understanding. 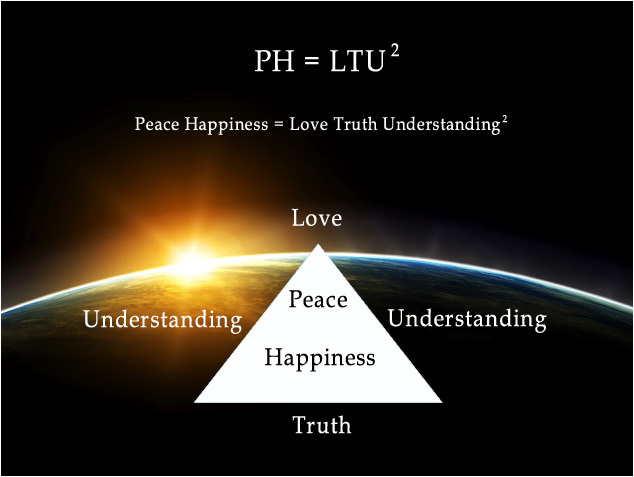 A combination of truth and understanding is necessary in order for Love to flourish. Wisdom is part of conscious awareness and conscious discernment. Conscious awareness and conscious discernment are derived from a combination of Love + Truth + Understanding (knowledge and compassion) or accumulated Experience. Wisdom = Experience (the thoughtful and responsible application of it). We have been given the gift of freewill and may choose to use it how we wish...to pursue constructive action, destructive action or anything in between. We can even choose to completely forfeit it if we wish (i.e. re-gift it to an outside authority such as government or religion to use and/or abuse in our proxy).